The key to the development of the media in Egypt is not the transformation of journalists but the transformation of institutions, argues Naomi Sakr in her new book, Transformations in Egyptian Journalism. 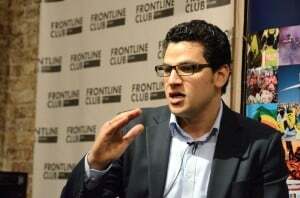 “I wanted to demonstrate that journalism as such may be the least of the problems in the Egyptian media,” said Sakr at an event organised by Reuters Institute for the Study of Journalism and hosted by the Frontline Club on 5 February. 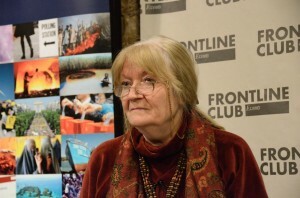 Naomi Sakr at the Frontline Club. Photograph: Richard Nield. According to Sakr, other challenges include the drafting of new media laws, the organisation of journalists as a trade, and the forging of a genuine public service media landscape when commercial owners are too often motivated by personal interest. Sakr told of how 25TV, a liberal secular television station created in April 2011 with a small budget and based on the talents of “eager young people and experts in social media”, has already folded. The channel was apparently forced off the space it was using on one of the satellites owned by Nilesat, a private company based in Egypt, without either an explanation or an alternative being offered, said Sakr. The reasons for the jamming of the channel are unclear due to a typical “lack of transparency”. But the existence of a Muslim Brotherhood channel known as Misr 25 may have caused a “potential mix-up”, said Sakr, adding that Misr 25 was “not very upset” when 25TV ceased to exist. 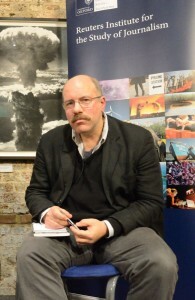 Much has improved in the Egyptian media sector since the overturning of President Mubarak’s regime in 2011, including a proliferation of newspapers and the emergence of journalists with a greater understanding of “normal people’s problems”, said Mustafa Menshawy, the former Cairo-based BBC Arabic service correspondent. But other barriers remain, such as the continuing influence of the Journalists Syndicate, which is “sadly the only body enabling you to be a journalist,” said Menshawy. But Menshawy was positive about the future. But there is a danger to assuming that all change is good from a liberal democratic perspective, said Dr Walter Armbrust, Hourani Fellow and lecturer in Modern Middle Eastern Studies at the University of Oxford. For Sakr, the creation of an effective legislative framework for the Egyptian media is paramount to the development of journalism in Egypt, but it will be a long process.